We all love to see our investment portfolios growing over time. To do that, businesses with the capability to grow significantly for the long haul need to be a part of those portfolios. 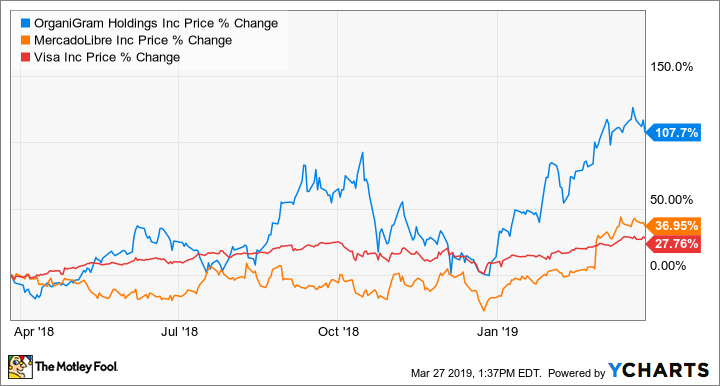 So we asked three of our Motley Fool contributors to highlight a stock they think has incredible growth opportunities. Here's why they picked OrganiGram Holdings (NASDAQOTH:OGRMF), MercadoLibre (NASDAQ:MELI), and Visa (NYSE:V). Sean Williams (OrganiGram Holdings): Nothing says "high growth stock that's just getting started" more than a marijuana stock. And no cannabis grower provides more intrigue than small-cap OrganiGram Holdings. To be honest, differentiation among growers is somewhat hard to come by in the early stages of the Canadian legalization process. But that's not the case with OrganiGram. It's the only major grower (i.e., projected to produce in excess of 100,000 kilograms a year at its peak) in the Atlantic region of Canada. Being headquartered in New Brunswick gives OrganiGram easier access to its home province as well as Newfoundland and Labrador, Prince Edward Island, and Nova Scotia. Though these are less-populated provinces and territories within Canada, early data from Statistics Canada shows that residents there use cannabis more often. That's a good thing for OrganiGram and its proximity. Beyond just geographic advantages, OrganiGram also offers a number of efficiency upgrades relative to its peers. At its Moncton campus in New Brunswick, the company is using its proprietary three-tiered growing system to maximize its cultivation space. Despite only 490,000 square feet of growing capacity, management expects 113,000 kilos of peak annual output. That'll place OrganiGram among the top 10 growers in Canada by peak yearly output, and its 231 grams per square foot of production is well over double the industry average. As icing on the cake, the fact that the company is only operating at a single grow site helps to minimize its expenditures. That brings me to the most attractive aspect of OrganiGram: its fundamentals. Typically, pot stocks have astronomical P/E ratios. As for OrganiGram, it's valued at a perfectly reasonable 24 times fiscal 2020 EPS and is expected to see revenue grow from $9.3 million in fiscal 2018 to a consensus estimate of $176.4 million in fiscal 2020. This attractive pot stock is literally just getting started, and you'd be wise to keep a close eye on its progress. Check out the latest earnings call transcripts for MercadoLibre, Visa, and other companies we cover. Brian Stoffel (MercadoLibre): Earlier this month, Latin American e-commerce specialist MercadoLibre reported earnings, and shares boomed. Given that the stock has already advanced 3,000% in the past decade, you might think you're too late to the game for this growth stock. The company has been cracking down on low-priced goods from vendors, but it still serves as a marketplace in South and Central America akin to eBay. With the recent focus on fulfillment and free-shipping capabilities (through MercadoEnvios), MercadoLibre is beginning to benefit from the same advantages as the 800-pound gorilla in e-commerce, Amazon. The star of the latest earnings report was the payment system MercadoPago, which is like a Latin American version of PayPal. Specifically, MercadoPago is getting so popular on its native continent that off-line payments will soon eclipse online ones. That means it is benefiting from strong network effects: As more merchants accept MercadoPago, more consumers are drawn to use it. Add all three of these businesses together along with a rising middle class, and I think MercadoLibre has a very long runway for growth. Tyler Crowe (Visa): If we were to only look at the North American market, it's hard to categorize Visa as a growth stock. Credit card penetration is relatively high, and credit, debit, and electronic payments now have the lion's share (59%) of transactions in North America. That isn't the case globally, as 77% of transactions are executed with cash. To be fair, that is down from 89% five years ago, but it goes to show how much room Visa and other electronic payment methods have left to grow. What's more important is that Visa has shown it is able to capture that, as its revenue and EPS have grown 73% and 120%, respectively, over the past five years. Management anticipates that revenue growth for 2019 will be in the low double-digit range as it continues to make headway capturing a greater portion of the global payment market as well as a share of the business-to-business transaction market. From an investor perspective, even modest growth would be encouraging because Visa is so good at converting its revenue to free cash flow. This is a high-margin business that takes little to no capital expenditure to maintain itself, which means that the company generates 58 cents in free cash flow for every dollar of revenue. With the ability to generate that much cash -- and with global transactions presenting such a lucrative long-term growth catalyst -- Visa still has a lot of investor returns to come.